Well, I guess that little piece of hospitality history, in the photo to the left, is well know by many. Thanks for sharing your knowledge. "Is now the closed "economy" motel on RT 20 across from Riverview Ave., west end of Sturbridge... Don't you just love that sign! Are you serious about where the Bay Path Motel is? If you are, some history. 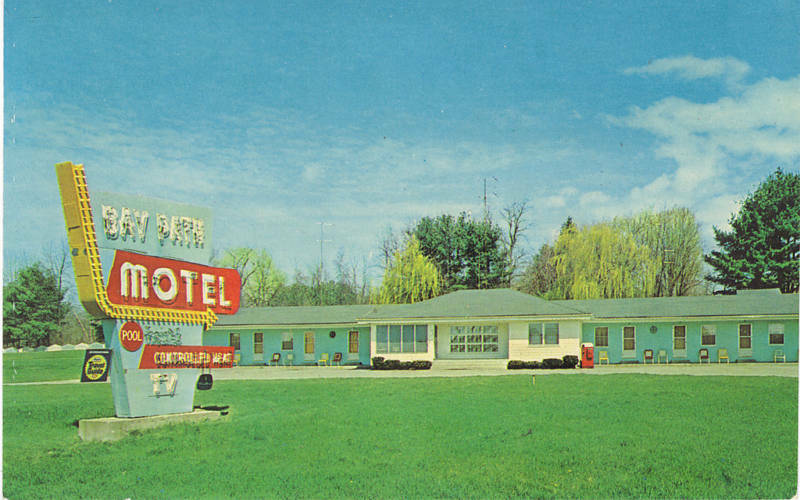 The motel is located at 682 Main Street and was built in 1978 by George Crompton, an English bloke, and he and his (very nice) family ran it until 2001. It was then sold to Yen Hospitality and, in 2006, changed owners again to Fiskdale Hospitality LLC. The last time I went by it was an Econo Lodge. I believe the Bay Path Motel is on rte 20 in the area across from G & F Industries near the Brimfield town line. It is still there and has a different name and is for sale. A few more details come to mind the Bay Path is on rte 20 across from Riverview road and is for sale and I believe the last name it had was Econo Lodge. Digging through an old bin, came across a room key for the Bay Path Motel. Stayed there with my mom back in . . . gosh, maybe 1978 or 1980. It was old then, a real holdover from the old motor coach places. The key tag reads "Bay Path Motel, RT 20, Sturbridge, MA 01566. 21. Drop in any mail box, we guarantee postage.